The Rico zipped purse is sophisticated and compact with a minimalist design, focusing on the craftsmanship of the iconic hand-stitched pampa diamond which decorates the front of the leather piece. This diamond has been hand-woven using the finest wax-dipped saddlery threads. This is a traditional practice which you will find on pampeano world-renowned polo belts that involve years of South American heritage. Each piece in pampeano&apos;s leather collection is made by hand, meaning that no two will ever be quite the same, making them as individual as you are. The Rico zipped purse measures 19cm wide by 9.5cm high and is secured with an antique brass coloured zip with pampeano oval zip pull which is synonymous with pampeano&apos;s exquisite leather collection. As the wallet is unzipped, a beautiful pale blue colour is unveiled, as each and every pocket of the purse has been lined with the most luxurious genuine suede which is powdery blue, and reminiscent of its roots in South America, depicting the colours of the Argentine flag. Eight perfectly sewn credit card slots can be found inside, placed on either side of the large open compartments which are perfect for holding your notes of all currencies, and separating your receipts. The central suede compartment is zipped to secure all of your coins and smaller items. 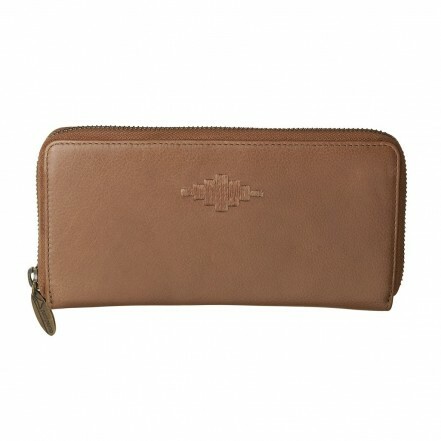 Discreetly placed behind the card slots, you will find full-length slip pockets on either side which are perfect for safely stowing away tickets and documents. The Rico zipped purse is also available in brown and black leather.